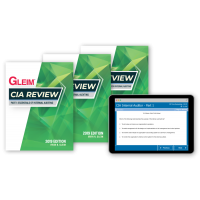 The Gleim Premium CIA Review System is the most widely used CIA prep on the market and includes everything a busy CIA candidate needs to pass the CIA Exam on the first try. The system integrates all of the available materials into an easy-to-use, 3-step approach featuring adaptive learning technology so candidates can diagnose weak areas, study from review materials written by professional educators, and apply knowledge with the most realistic, exam-emulating multiple-choice questions on the market. 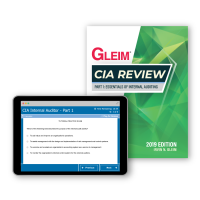 As long as you are preparing for and taking the CIA exam part(s) for which you purchased the Gleim Premium CIA Review System, we will ensure that you have current Access Until You Pass®. 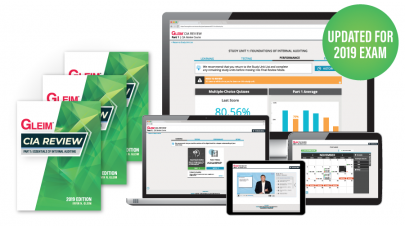 Your electronic material will update automatically in the event of content changes or a new edition, and we’ll ship you the new edition book for only the cost of shipping. If you follow the Gleim “suggested steps” detailed in our Premium CIA Review System, are unsuccessful in passing the exam, and are not satisfied with the System, we will refund your purchase price paid for the applicable parts. 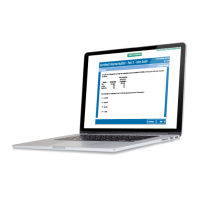 You must request this refund within 18 months of your purchase.